» Election worries: Then there’s M97! Election worries: Then there’s M97! 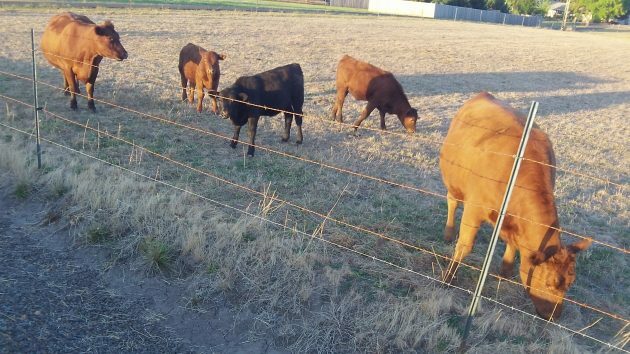 Unlike the rest of us, these cattle on Bryant Drive can remain unconcerned by the implications of Measure 97. As if our choices in the presidential election looming in November were not enough to make people uneasy, Oregon also has to think about Ballot Measure 97. The tax experts working for the legislature analyzed this initiative last spring, and their report tells you all you need to know about what would be the largest tax hike in the history of the state. You can read the 20-page analysis of what was then known as Initiative Petition 28 at https://www.oregonlegislature.gov/lro/Documents/IP%2028%20-%20RR%203-16.pdf. The bare details are that the measure would impose a gross-receipts tax of 2.5 percent on Oregon sales by C-corporations above $25 million a year. This would yield an estimated revenue increase to the state of $3 billion a year or $6 billion every two-year budget period. The 274 largest corporations based on Oregon sales would face a tax hike of $2 billion a year. A coalition of public-sector unions put this proposal on the ballot in order to increase — what else? — resources for employment in the public sector. But even though the initiative is aimed at large corporations, the legislative analysis makes clear that Oregon residents would pay the price. Two items stand out in the analysis. One is that the corporate tax increase would likely be reflected in higher prices for most of the stuff we buy, amounting to an average increase of $600 a year for the average Oregon consumer. The other is that while the public payroll would grow faster, private employment would slow down. The analysis says that with the measure in effect, public employment in 2022 would likely be 17,700 jobs greater than now projected. And employment in the private sector would be about 38,200 less than currently forecast, with over half of the decline coming in retail and wholesale trade and health services. Business does not now nor has it EVER really paid tax, We pay Billions in what government calls tax, but in reality it is simply a cost of doing business. Because we get our money from our customers, it is our customers who actually pay the tax….. We are not in business to be nice guys, we may well be nice but it is the same reason workers go to work, Money, if we don’t make enough we have three choices, raise prices, source the stuff from outside sources, or go out of business… the first one……you pay, the second one there are fewer jobs, and the third……there are no jobs…… any way you look at it, you pay the price…. The only thing all levels of government do really well is spend other people’s money. And they always want more. So this would have about a $600.00 a year effect per household. I wonder what the effect on the costs of goods will be as our minimum wage is forced higher by our liber legislature ? Add in local tax increases to cover; school operations, build new schools, build new fire district facilities, the new Albany PD and fire station as well as other tax levies. Where is the tax payer going to find their money to pay for all of this ? When does squeezed turn into strangled ? The average family is still hurting and has not financially recovered. We are on reduced or fixed incomes. Maybe government needs to learn to do the same. Make sure your councilors, commissioners, representatives, and senator know EXACTLY how passionate you are about this. I am not a fan of measure 97 but I am not hearing any solutions to the PERS shortfalls from the opponents of measure 97.
it is not earmarked specifically for PERS or Seniors or anything. They can spend it on what ever they want. Passing 97 is no guarantee that PERS will get fixed. It boils down to being a sales tax that they haven’t been able to pass any other way. As far as the PERS deficit, workers in PERS are probably concerned…those out here on non-public retirement systems getting half of what a State worker gets maybe not as concerned. PERS benefits over the years were over promised, over negotiated and the politicians that did so should be held accountable. You can’t promise raises, benefits or retirement funds without an existing way to pay for it. They failed PERS. I am just not sure that the taxpayers will be able in any form to bail PERS out. More cuts and budget juggling will probably be needed. want to fix it??? Stop electing people who think everything can be fixed by government. Start with making Charter schools more of a reality, the more competition there is the less it costs..
lol… I don’t think Charter schools will dig us out of billions in unfunded liabilities. That’s right. More right wing meme. Prop up and promote Charter schools in an effort to undermine public schools. In reality, they would really like to do away with public schools all-together. Read as less taxes for them to pay. It’s all about competition, accountability, the system does not allow teachers to go outside the “norms” very far, and without that there can be no real innovation. Charter schools can innovate, regular schools have a lot harder time because of the rules they live in. Start electing more like Kellum and in no time, the much-anticipated, but now proven to be no better at educating youngsters Charter Schools will have eliminated Public Schools where, by the way, educators earn a living wage. The Charter concept was designed to eliminate Teacher unions and little else. If Charter schools do the job but “are no better” why would the public schools be gone….. unless it is done at a much lower cost to receive that same quality… No what charter schools were started for is to make some competition and some innovation…. Maybe we need fewer “tax experts” and more “efficiency experts”? Talk about “we all pay” is bandied about like its something new. Of course we all pay. THAT IS NOT THE ISSUE. We should all pay. We should all be responsible for the costs necessary to provide the schools, roads, teachers, parks, health care, and every other service provided through our government. I have qualms about M97 with it’s “tax the fella behind the tree” approach. I would prefer to see a broader approach, but as Kellum and others keep saying “it’s our customers who actually pay the tax”. So why should I worry. Any tax configured any way is paid by us all. And by people out-of-state too. So absent ANY approach proposed by business or the right-wing to raise ADDITIONAL monies to fund things like longer school years, getting lead out of school water supplies, hiring more teachers to lower class size, and expanding the training of teachers in universities without bankrupting those students after they graduate, what should people do? The legislature can’t do it because conservatives encouraged the initiatives that established super-majority requirements to pass new funding measures in the legislature, guaranteeing minority veto power. Which they use. So now the unions are using the same initiative approach to fix the problem that the minority veto rule has created. The House is Democrat, the Senate is Democrat, the Governor is Democrat……..Veto Proof. Mandated expenses going thru the roof, medical, wage, medical leave, energy and now a gross receipts tax on Oregon Business but not China…………. brilliant Democrat knowledge of business… you and your programs to have other people pay more for your expenses…. Oregon requires a 3/5 majority (60%) vote for the legislature to raise taxes. The reality is that drives the parties to be more radical, since a minority can stop the majority. It ups the stakes and makes compromise HARDER. Just look at where we are! Correct way to go just the wrong direction? Take a look at two states: California & Kansas. Both made moves on taxes in recent years. Cali raised the tax rate on millionaires & billionaires. Kansas slashed income and sales taxes. Results dispel the popular Republican rumor that tax reductions spur growth. Quite the opposite when you look at these two states. Cali’s economy has been growing and well Kansas on the other hand is effectively in recession. I say raise revenue on the backs of those who CAN MOST afford it. Those millionaires and billionaires not corporations (although they can afford it also). And, guess what, they’ll benefit too. This is obviously a sales tax, called by another name. Costs will be paid by the consumer, the citizens of Oregon, not by the corporations. Reject this, as we have rejected all other attempts at a sales tax in addition to our already high income and property taxes.